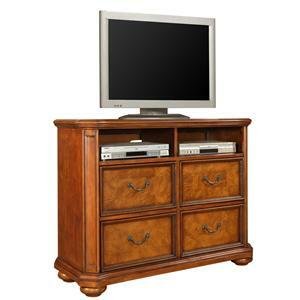 Bring modern day luxury to your traditionally styled master bedroom with this attractive media chest. 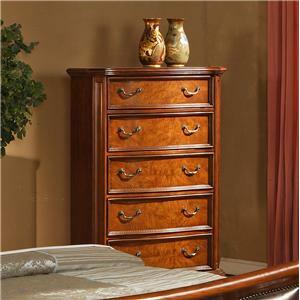 Four deep drawers provide space for storing DVDs, chargers, electronics, remotes, and other media accessories. An open case shelf with a center partition offers two spaces for media players and easy wire management. 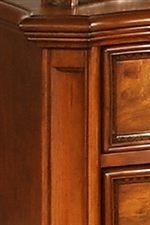 Case details include crown molding at top and bottom, fluted case corners, dentil molding on drawers, antique brass hardware, and turned bun feet. 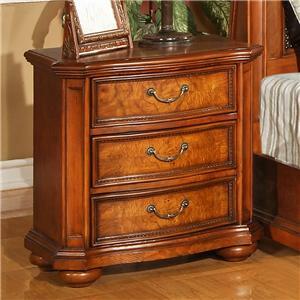 The 0243 4 Drawer, 1 Shelf Media Chest by Lifestyle is available in the area from BigFurnitureWebsite. 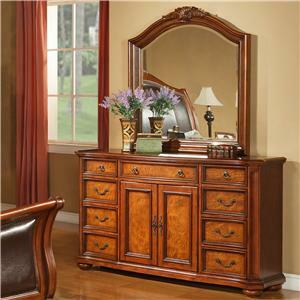 The 0243 Bedroom Collection includes an upholstered sleigh bed in three sizes, nightstand, dresser, dresser mirror, drawer chest, and media chest. 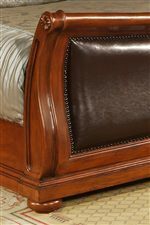 The collection is constructed from wood solids and veneers in a bright Antique Cherry finish. 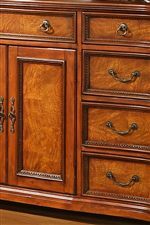 Detailing throughout the collection is intricate and ornate, featuring Acanthus Leaf, daisy applique, crown molding, paneling, dentil molding framed drawers, and fully turned bun feet. 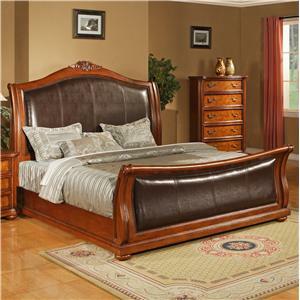 Headboard and footboard are upholstered in bonded leather that has seam paneling and nailhead trim, sloped in a sleigh design. 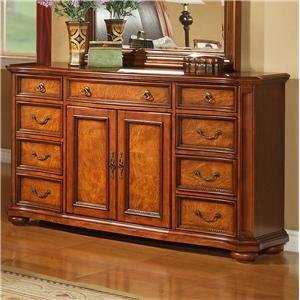 All drawer and door fronts are veneered and feature antiqued brass handle hardware. 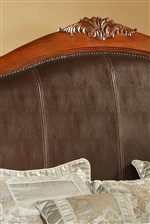 Indulge yourself and sleep like royalty by outfitting your master suite with the 0423 Bedroom Collection. 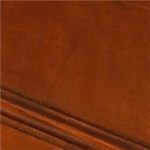 The 0243 collection is a great option if you are looking for Traditional furniture in the area. 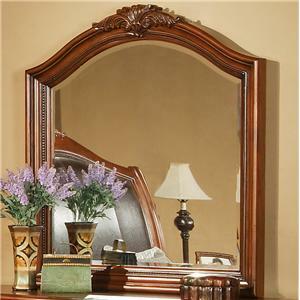 Browse other items in the 0243 collection from BigFurnitureWebsite in the area.